Well I have had one of the craziest weeks in a while. I had to work most of it. In total I worked over 24 hours since Friday night. My sleep pattern is off. My eating pattern is way off too. And BTW, I'm flying to France next Tuesday for work. So just as I get my patterns back in order, I have to get way out of whack again. I'll be in Toulouse, France for a week. I'm really excited, I have never been there and I hear is really beautiful. One little problem, Je ne parle Francais. I will be there 3 days for work and 3 days for fun. I want to go to Lourdes, France as well, it's only 2 hours away by train. It should be a very touching experience for me. There are a couple of things I want to get when I go. I want to find a used old french dictionary, maybe some books too so I can use them in my scrapbooks. I also want to find some Rouge De Garance papers. Maybe some other great French papers as well. I was also told to shop around the area they have great trims and ribbons. I can't wait to wonder around with my little pocket phrase book. I'm so excited, class is full. I can't believe it. Thanks everyone who has signed up. I shall be finishing the kitting process this week before I leave. Well it has been crazy in my side of town. I figured that if I updated my blog at least weekly I was doing better than before, when I wasn't really keeping up with anything. Well last Wednesday, I made a drastic change. I cut my hair really short, at the collar bone. I have been waiting on pictures they took of my before and after, but no pics yet. Afterwards I had a hard time getting used to the new hair do. Everyone seems to love it. I'm beginning to fall in love it. I really enjoy the fact that my head weighs about 5 pounds lighter (or at least it feels like). I'll post pics when I take them (or if I ever get them from my hair salon). Friday and Saturday were the Scrapbook Expo in Pleasanton. I really enjoy having fun and meeting up with my dear friends. We all met about 5 years ago this August (I think, I loose count) Patty, Debbie, Rhonda and I were all at expo volunteering at the crop and all had the same idea. "I wish I could crop with others here at expo but I don't know anyone in my area". Patty grabbed our email addressed and collected and kept up with us. For the next expo we all got to sit together and met Eva. Since then, it's a tradition, we crop at least one of the two nights at expo together. Last year, Debbie wasn't able to crop with us since she was in charge of them. But at least we could chat with her for a little bit. Well this year was just like before. We all go to share a table on Friday. It was just like old times. On Saturday, I was invited to share the table with Carla, Satyn and Noel. It was great fun, I had been in the mood to scrap, and was really tired but stuck around until the end. I'm so glad they invited me over and had so much fun. I took several classes from SEI. I always know that I will learn a new technique at their classes. I was also a teacher's pet for both classes that Scrap for a Cure was hosting at expo. Ginger was so creative, I was so loving the classes and couldn't wait to get to them. If you haven't heard of Scrap for a Cure, it's such a great kit club. They donate 5% of their sales which go towards a foundation they hold dearly. This quarter's foundation is Juvenile Diabetes Research Foundation. Such a great idea and their kits are full of product. I'm in love with their project kits. I got 3 of them at Expo. I can't wait to do them all. Check them out. So this week, I'm hoping to finish kitting my Dear Mother class and get caught up in finishing my CJ. It's due on Saturday. Diasque. My little fur devil of a cat. This morning I woke up early to try to get the pics I had promised to upload. Well Diasque wanted to play along too. Yep he needs to know everything that goes on in our house. He is just so smart, we say all he is missing is to talk to us. He will let us know of everything that he needs. And makes sure that we do it for him. He is just so adorable. Here is a great photo I got of him this morning. I got to it and it was done by 5pm last night. But let me rewind a little. In the early evening of Saturday, I was able to do really great work, but by 2am Sunday, I was down to just adding title to the ATC. I swear it was funny coming Sunday around noon to see all the work I had done the previous night. I got to work and finished all of my CJ. I wanted to use my "new" old typewriter to write out my CJ. Yeah, it's a great idea, but I have learned two things: 1. Never use a typewriter when you are tired and 2. Write it out first and then type it out. It will save you tons of rework. Yeah, my CJ has a lot of grammar mistakes along with a few words that have gone missing from my brain to the typewriter. I hope to rewrite it before I turn it in on the 22nd. But who knows. There is one tag that I didn't get a chance to include. 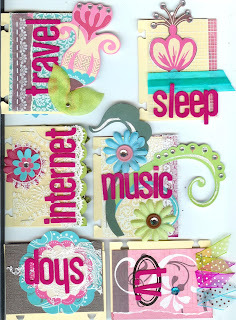 But it's about scrapbooking. 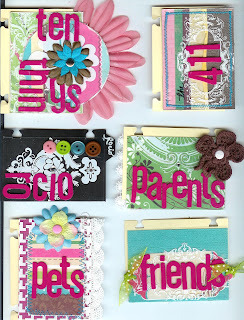 I'm using the Pansy line from My Little Shoebox and also the new ATC Hambly overlays. It makes me feel so happy. Bright colors in pinks and teals. Love how the CJ came out and I can't wait to see what everyone else in the group will do. I guess I have to wait until November to see it all. Last night I got home and went to sleep right away. I can't even recall what time it was. All I know is that I'm ready for a busy week here at work. Need to get some projects done. Today I have been listening to Alejandro Sanz. One of my favorite singers in the entire world. I even went to Vegas just to see him in concert. I love his music and can't stop at just one song. There are way too many songs that are my favorites. I fell in love with him and his music back in '98 when he came out with the song "Corazon Partido" or broken heart. Since then he has had hit after hit. My current fave is "Te lo agradezco pero no" and he duets with Shakira. It's pretty amazing his voice and lyrics are just truly out of this world. If you get a chance go to youtube and search for him. Enjoy his music. Here is his video from "Te lo agradezco pero no"
Ok, I'm not sure how it will all go, but I figured it was a place to start. So here is to hopefully updating everyone every chance I get. Welcome to my crazy blog about anything that's on my mind at the moment.